The Ballantine Adult Fantasy series was an imprint of American publisher Ballantine Books. Launched in 1969 (presumably in response to the growing popularity of Tolkien's works), the series reissued a number of works of fantasy literature which were out of print or dispersed in back issues of pulp magazines (or otherwise not easily available in the United States), in cheap paperback form—including works by authors such as James Branch Cabell, Lord Dunsany, Ernest Bramah, Hope Mirrlees, and William Morris. The series lasted until 1974. Envisioned by the husband-and-wife team of Ian and Betty Ballantine, and edited by Lin Carter, it featured cover art by illustrators such as Gervasio Gallardo, Robert LoGrippo, David McCall Johnston, and Bob Pepper. The agreement signed between the Ballantines and Carter on November 22, 1968 launched the project. In addition to the reprints comprising the bulk of the series, some new fantasy works were published as well as a number of original collections and anthologies put together by Carter, and Imaginary Worlds, his general history of the modern fantasy genre. The series was never considered a money-maker for Ballantine, although the re-issue of several of its titles both before and after the series' demise shows that a number of individual works were considered successful. The Ballantines supported the series as long as they remained the publishers of Ballantine Books, but with their sale of the company to Random House in 1973 support from the top was no longer forthcoming, and in 1974, with the end of the Ballantines' involvement in the company they had founded, the series was terminated. After the termination of the Adult Fantasy series, Ballantine continued to publish fantasy but concentrated primarily on new titles, with the older works it continued to issue being those with proven track records. In 1977, both its fantasy and science fiction lines were relaunched under the Del Rey Books imprint, under the editorship of Lester and Judy-Lynn del Rey. Carter continued his promotion of the fantasy genre in a new line of annual anthologies from DAW Books, The Year's Best Fantasy Stories, also beginning in 1975. Meanwhile, the series' lapsed mission of restoring classic works of fantasy to print had been taken up on a more limited basis by the Newcastle Forgotten Fantasy Library, launched in 1973. All books in the "series proper" bore a distinctive Unicorn's Head colophon on the cover and included an introduction by Carter. Ballantine published these fantasies and fantasy criticism before hiring Carter as consultant. 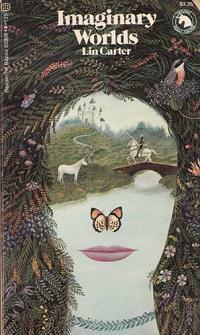 Some were labeled "A Ballantine Adult Fantasy" on the first Ballantine cover. Later reprints of some bore the Unicorn's Head colophon. Volumes published as part of the series, based on a listing by Lin Carter in Imaginary Worlds: the Art of Fantasy with the addition of books new to Ballantine published under the Unicorn's Head colophon thereafter. Two volumes published after retirement of the Unicorn's Head colophon were evidently intended for the series. The first has a Carter introduction and the second completes a set of four begun under his editorship. Carter intended to reissue or compile these books for the series, according to statements in his introductions to other books in the series and lists discovered among his effects after his death or elsewhere. A few were later issued in the Newcastle Forgotten Fantasy Library, a fantasy revival series similar to the Ballantine Adult Fantasy series published between 1973 and 1980. ^ "Preface: The Beat Goes On" by Karen Haber in Meditations on Middle Earth, edited by Karen Haber (2001, ISBN 0-312-30290-8), p. xii. ^ a b c "Lin Carter". Science Fiction Encyclopedia. ^ Williamson, Jamie (2015). The Evolution of Modern Fantasy: From Antiquarianism to the Ballantine Adult Fantasy Series. New York: Palgrave Macmillan. ISBN 1137518081. Retrieved 5 October 2015. ^ Cowan, Yuri. "Recovering the Barbarians: Reprinting "Forgotten Fantasy" in the 1970s". Érudit. Consortium Érudit. Retrieved 5 October 2015. ^ a b Carter, Lin. Imaginary Worlds: the Art of Fantasy. Ballantine Books, 1973. ^ Clore, Don. "The Ballantine Adult Fantasy Books That Never Were." In Apostle of Letters: The Life and Work of Lin Carter, ed. Stephen J. Servello, Wild Cat Books, c2006, pages 159-164. This page was last edited on 21 April 2019, at 02:41 (UTC).